Preprints (earlier versions) of this paper are available at http://preprints.jmir.org/preprint/4954, first published Jul 17, 2015. Background: Ecological momentary assessment (EMA) is a method of collecting real-time data based on careful timing, repeated measures, and observations that take place in a participant’s typical environment. Due to methodological advantages and rapid advancement in mobile technologies in recent years, more studies have adopted EMA in addressing topics of nutrition and physical activity in youth. Objective: The aim of this systematic review is to describe EMA methodology that has been used in studies addressing nutrition and physical activity in youth and provide a comprehensive checklist for reporting EMA studies. Methods: Thirteen studies were reviewed and analyzed for the following 5 areas of EMA methodology: (1) sampling and measures, (2) schedule, (3) technology and administration, (4) prompting strategy, and (5) response and compliance. Results: Results of this review showed a wide variability in the design and reporting of EMA studies in nutrition and physical activity among youth. The majority of studies (69%) monitored their participants during one period of time, although the monitoring period ranged from 4 to 14 days, and EMA surveys ranged from 2 to 68 times per day. More than half (54%) of the studies employed some type of electronic technology. Most (85%) of the studies used interval-contingent prompting strategy. For studies that utilized electronic devices with interval-contingent prompting strategy, none reported the actual number of EMA prompts received by participants out of the intended number of prompts. About half (46%) of the studies failed to report information about EMA compliance rates. For those who reported, compliance rates ranged from 44-96%, with an average of 71%. Conclusions: Findings from this review suggest that in order to identify best practices for EMA methodology in nutrition and physical activity research among youth, more standardized EMA reporting is needed. Missing the key information about EMA design features and participant compliance might lead to misinterpretation of results. Future nutrition and physical activity EMA studies need to be more rigorous and thorough in descriptions of methodology and results. A reporting checklist was developed with the goal of enhancing reliability, efficacy, and overall interpretation of the findings for future studies that use EMAs. The number of overweight or obese youth in the United States is alarming for public health professionals, as prevalence of overweight/obesity among youth is estimated to be 31.8% . National data suggests that only 15.7% of adolescents ate vegetables 3 or more times during the past 7 days and only 29% of adolescents achieved 60 minutes of physical activity per day . US children and adolescents’ lifestyle factors, such as poor diet and physical inactivity, are related to an increased risk for chronic diseases, including diabetes, hypertension, cardiovascular diseases, and other metabolic disorders [3,4]. Many current methods for assessing nutrition and physical activity (eg, dietary recalls, physical activity logs) are limited since they can introduce high participant burden  and are prone to inaccuracies. More studies that use assessment methods that may limit participant burden and provide ecologically valid data for nutrition and physical activity behaviors are needed. Advances in electronic technologies and societal changes have created opportunities to assess youth nutrition and physical activity behaviors as they occur in their daily lives. Real-time data capture methods refer to collecting data as it naturally occurs . Real-time data assessments differ from traditional retrospective data collection methods as they sample snapshots of participants’ lives to capture the variability of experiences more accurately. As information is collected at or near the moment when events and experiences occur, real-time data capture methods can reduce memory and other biases that are associated with retrospective recall measures . Ecological momentary assessment (EMA), a type of real-time data capture method, was originally developed for psychological assessments of mood and affect . Shiffman and colleagues  define EMA as “monitoring or sampling strategies to assess phenomena at that moment they occur in natural settings.” There are several unique features common to the EMA methods: (1) the data capture happens in subjects’ natural environment—the “Ecological” aspect of EMAs; (2) assessments focus on current feelings and behaviors, rather than concentrating on recall or summary over long periods of time—the “Momentary” aspect of EMAs; (3) the moments are assessed by random sampling, event-based sampling, interval sampling, or a combination of any of these strategies; and (4) multiple assessments are collected over time to provide a profile for behavior throughout time—the “Assessment” aspect of EMAs . Nutrition and physical activity studies that employ the EMA methodology enable the collection of data with an array of variables including behavioral, physical, sociopsychological, and contextual information . This assessment strategy makes it possible to examine concurrent exposures and events, such as examining where and with whom physical activity and sedentary behavior are likely to occur during the course of participants’ everyday lives . Due to the repeated measurements used in EMA methodology, EMA studies are able to focus on within-person changes in behaviors and experiences over time, thus allowing the investigation of antecedents and consequences of a behavior , and the advanced modeling of how variation in momentary cognitive state might relate to behaviors . Over the past several years, there has been an increase in the popularity and prevalence of research conducted using EMAs. Given the potential methodological and analytical advantages of using EMAs in nutrition and physical activity research in youth, this review is aimed to describe features of EMA methodology in studies that address nutrition and physical activity in children and adolescents. In addition, although some guidance is available for designing and reporting in EMA studies , there are currently no specific guidelines for the necessary detail in reporting in EMA studies, which could make a systematic synthesis of results from EMA studies challenging. Similar reporting checklists for other types of studies have been widely adopted. For example, the Strengthening the Reporting of Observational Studies in Epidemiology (STROBE) is a commonly used checklist of items for observational studies . It contains 22 items that relate to the title, abstract, introduction, methods, results, and discussion sections of papers with the goal to improve the quality of reporting. Building on the STROBE checklist and the EMA design guidelines by Stone and Shiffman , a comprehensive checklist of specific items to be reported for EMA studies was also developed: Checklist for Reporting EMA Studies (CREMAS). CINAHL, PsychINFO, PubMed, and EBSCOhost were searched for relevant studies that were published before July 2015. The keywords used included “ecological momentary assessment” and “EMA,” in combination with “food,” “nutrition,” “eating,” “food consumption,” “eating habits,” “physical activity; PA,” “text messaging,” “SMS telephone,” “electronic diaries,” and “prompting.” A hand search of the reference section of all papers was conducted to review for additional papers that were missed during the electronic search. Inclusion criteria for this review were as follows: (1) published in English, (2) used EMA-based data collection method, (3) had a mean participant age of 22 years or younger (or enrolled in a college/university), and (4) focused on the assessment of nutrition or physical activity habits. Studies were excluded if they did not have repeated measures, did not assess variable/outcome measures via EMAs, had a mean participant age greater than 22 years, assessed maladaptive or disordered nutrition or physical activity behaviors, and/or were intervention studies. Further, papers must have reported results of EMAs; papers that only described EMA design were not included. 5. Response and compliance: participation rate, gathered data, missing data (ie, unanswered and/or unprompted EMA surveys), latency (ie, the time period between when participants receive an EMA prompt and when the EMA is answered), and attrition (ie, the number of participants who dropped out of the study for any reason). For studies that did not report any of this data, calculations were performed using information provided in the paper whenever possible. A coding form was developed based on the above areas of interest and two raters extracted information from each study independently for all items. Agreement among raters for each item ranged from 85 to 100%, and all discrepancies were resolved through discussions that led to consensus. After completing a systematic review of databases and reference lists, a total of 428 potentially relevant studies were screened. From this group, 62 article abstracts were identified and evaluated for inclusion criteria, and 23 were selected for further full-text review. In cases where multiple papers were published (n=5) on the same study (eg, reporting validity, reporting outcomes, translations, etc. ), information was extracted from all papers and presented as a single study. On the basis of the abovementioned criteria, 13 independent papers were retained for inclusion in the review, 7 studies were physical activity-related, 5 focused on nutrition outcomes, and 1 study assessed both physical activity and nutrition behaviors. Figure 1 presents a flow chart of the systematic literature search, according to the Preferred Reporting Items for Systematic Reviews and Meta-Analyses (PRISMA) guidelines. Sample characteristics and methodological features of each included study are presented in Table 1. The mean number of participants per study was 391 (range=30-1604, median=147). However, this mean is skewed by 5 studies with samples over 500 [14-18]. Excluding these 5 studies, the mean sample size was 82 (range=30-158, median=63). Two studies did not report mean age [19,20]. Excluding those 2 studies, the mean sample-weighted age of participants was 15.6 years, with a range of 5.3-21.0 years. One study asked participants to respond to the question, “What are you doing now?” All other studies used retrospective questions (ranging from every 15 minutes to 4 hours) to assess nutrition and physical activity behaviors. Only one study combined EMA with an objective measurement (ie, accelerometry) . Figure 1. PRISMA Flow Diagram for paper selection process. aTechnology: operating system, device type, and/or phone model (in as much detail as was provided in the paper). bPrompt approach: type of EMA sampling. cMonitoring periods: number of waves EMA was used in the study. dDuration: number of days each monitoring period lasted. ePrompt frequency: number of times it was intended for participants to answer EMA prompts. fPrompt interval: time between each EMA prompt. Table 1. Methodological features of ecological momentary assessment (EMA) nutrition and physical activity studies in youth. The majority of studies (9 out of 13) monitored participants during one period of time (ie, one wave of data collection), while other studies included up to 8 waves of data collection. The duration of each monitoring period included: 2 days (1 study), 4 days (6 studies), 7 days (5 studies), and 14 days (1 study). Studies with more than one monitoring period had smaller durations than those with only one monitoring period. Typically, the shorter the duration of the study, the higher the prompt frequency per day. For example, one study prompted participants 44 times on weekdays and 68 times on weekends during a 4-day monitoring period . The studies with the longest durations prompted their participants 4 times per day for 14 consecutive days . Seven of the reviewed studies had different prompting frequencies for weekdays and weekend days. In general, participants received more prompts during weekend days than weekdays. Prompting frequency ranged from 2 times per day (during weekdays) to 68 times per day (during weekend days), with the median being 7 times per day. The majority of the studies (9 out of 13) did not collect EMA data during school hours (eg, between 8am-3pm). There were several studies conducted by the same group of researchers that used the same prompting frequency schedule across studies: 44 prompts per day during weekdays and 68 prompts during weekend days [14,15,26,28]. Prompt frequencies varied significantly between studies that employed paper and pencil as compared with electronic data collection tools. For example, a paper-and-pencil study  utilized a prompt frequency of 7 times per day, while an electronic data collection EMA study prompted participants 20-30 times per day . A majority of the studies (7 out of 13) used electronic EMA methods and the rest of the studies used paper-and-pencil-based diary methods. For studies that used electronic EMA methods, 4 used cellular phones and 3 used handheld computers. Only one study used a combination of technology for the EMAs. This study divided the sample into two equal groups: one group completed EMAs via paper-based diary and the other group completed EMAs via cellular phones . With the exception of one study , studies that used electronic devices for the EMAs had relatively small sample sizes (n<175). Training sessions on the use of the EMA technology for participants were held in two studies. One study used parent-reported dietary consumption data for children aged 1.5-10 years old ; all other studies collected the self-reported data directly from the youth. Most (11 out of 13) of the studies used interval-contingent prompting strategy. Of these 11 studies, 5 used fixed interval contingent only (eg, every 15 minutes), 3 used random interval contingent only (eg, randomly within a 2-hour block), and 3 used combined strategies (eg, event based and interval contingent, interval contingent and evening report). One study used event-based strategy only for collecting EMA responses. The sampling strategy used by the studies seemed to be related to the behavior of interest. All but one study that measured physical activity used interval contingent sampling, while the majority of studies measuring nutrition habits used events-based sampling in their design. Table 2 summarizes the response and compliance-related results for all studies. Although most studies reported participant initial enrollment, only 2 studies formally reported attrition rate [19,20]. Another 9 studies reported their respective analytical sample size, although most of the studies did not clearly indicate why the analytical sample size varied from the initial enrollment (eg, participant attrition, device malfunction, or other reasons). For the studies that utilized an interval-contingent prompting strategy via electronic devices, none of the studies reported how many prompts were actually received by participants. Eight studies did not report the average number of percentage of EMA prompts answered by participants. No study reported reasons for unprompted or unanswered prompts. Among studies that reported compliance, compliance rates were relatively high (mean=71.3%), with reported compliance ranging from 43.8-95.9%. Compliance reporting differed for paper-and-pencil and electronic EMA designs. Only 2 (out of 6) paper-and-pencil designs reported compliance , whereas all of the electronic designs reported compliance rates. Results from Berkman et al compared compliance between paper-and-pencil and electronic EMAs, and reported that the electronic group was more compliant than the paper-and-pencil group (95.9 and 69.9%, respectively) . Even though several studies had more than one monitoring period, no studies reported compliance by wave. One study reported compliance by day  and reported that daily average compliance rates declined from 63% at the start of the study to 23% on day 7, demonstrating a decline in answered EMA prompts as the monitoring period progressed. Only 3 studies reported latency (the time period between when participants receive an EMA prompt and when the EMA is answered) of participant responses. In order to ensure the momentary nature of the responses, 2 electronically administered EMA studies designed their EMAs to prohibit responses 4 minutes  or 8 minutes  after signaling prompts were sent. No studies reported on why respondents were late responding to prompts. aInitial enrollment: number of participants who consented to the study. bAnalytical sample size: number of participants in the main analysis. cAverage answered EMA survey prompts (per participant): average of number of survey prompts each participant responded to. dAverage compliance rate: average of number of answered surveys out of total planned EMA surveys per participant, can include compliance for each monitoring period. eAverage latency (>15 minutes): the average time between prompting to participants answered the prompt. fNumbers were hand calculated from information available. gNRg: not reported in paper. Table 2. Ecological momentary assessment (EMA) response and compliance-related results from nutrition and physical activity studies in youth. 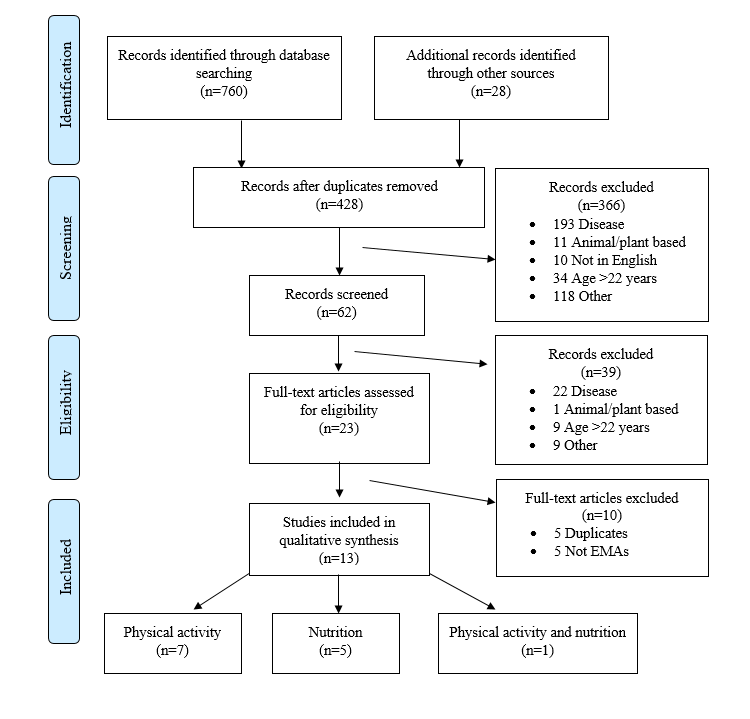 The primary aim of this study was to systematically review the literature on EMA methods and procedures relating to nutrition and physical activity in youth in order to describe the common practices in EMA methodologies, and to identify response and compliance rates for this target population group. There has been very limited research using EMA methodology to assess youth nutrition and physical activity behaviors. A total of 13 individual EMA studies met inclusion criteria for this review and varied considerably in methodological and results reporting strategy. Enhancements to design and reporting may increase the interpretability and generalizability of EMA findings, application to intervention projects, and ease of use when assessing nutrition and physical activity among youth. Overall, a significant amount of key information was not reported from studies that were included in this review, demonstrating the need for a reporting guideline that is tailored to the unique features of EMA studies, especially studies that utilize electronic devices. On the basis of results from this review and building on existing guidelines , CREMAS was developed to provide recommendations in reporting future EMA studies (Table 3). These recommendations to unify reporting include 16 items that address various sections in a manuscript, and in general, could be applied to EMA studies across disciplines. aSecondary data analysis paper can refer to a main methods paper that has discussed all of these items. Table 3. An adapted STROBE Checklist for Reporting EMA Studies (CREMAS). This review shows that studies have used both paper-and-pencil and electronic EMA designs to capture nutrition and physical activity in youth. Compared with paper-and-pencil design, there are several benefits to using electronic EMA designs such as automatic prompt signaling (eg, auditory or tactile), instant data transfer via download or Internet-based secure servers, and greater accessibility and convenience for participants . More importantly, electronic EMA collection instruments are able to collect exact times of each assessment and ensure that the assessments are completed following study protocols. Indeed, several studies have shown that even with signaling prompts and detailed instructions, the completion of paper-and-pencil EMAs may not occur in real time . Although technologies can assist in making the delivery of EMA surveys more systematic, they also have some limitations. For example, EMA surveys may fail to be delivered because of technological issues (eg, problems with the app) or user compliance issues (eg, subjects can have phone turned off). Therefore, it is important that authors report the intended number of EMA prompts and the actual number of EMA prompts participants received if possible. The utilization of electronic EMA devices may pose some challenges for some studies. For example, the electronic devices themselves can be a costly research expense. The majority of the reviewed studies that used electronic devices provided those devices to the participants (instead of participants using their own device), which ensured the consistency of the usability and functionality in the administration of EMAs. However, given the cost associated with providing loaned devices, drawbacks, such as limiting sample size and participant burden of remembering to keep the study device with them and charged, should be considered. Often, an experienced computer programmer and several rounds of pilot testing are needed to develop electronic EMAs to be administered on mobile phones or personal digital assistants (PDAs). Nevertheless, free open source EMA programs (eg, PACO by Google, MovisensXS by Movisens GmbH) are available and can be tailored to researchers’ specifications. In general, response and compliance-related data were inconsistently reported. This information is critical to assess the quality of data collected by a study. More importantly, these data will provide valuable information for future studies planning to adopt EMA methods in optimizing study design (eg, Will compliance rate be very different between a study that delivers 4 prompts a day versus a study that delivers 44 prompts a day?). This review is not able to answer this question fully because over half of the reviewed studies did not report compliance data. Therefore, it is highly recommended that all future EMA studies report response and compliance-related data, except for studies that only utilize event-based design with manually initiated reporting since there is no set number of diary entries or prompts that participants are required to complete. In addition, the majority of studies did not report latency. Due to the in-the-moment nature of EMA studies, it is critical that EMAs are completed shortly after prompts are received. One way to ensure the momentary nature of the responses is limit the time respondents have to complete the EMA, as was done by two studies included in this review [16,19]. Although there is no consistently agreed upon gold standard for acceptable rates of compliance to EMAs, Stone and Shiffman noted that if compliance falls below 80% there may be concern that data are not representative or generalizable to participants’ usual daily lives ; however, reasons for missing data (random vs. not random) should be taken into consideration. Thus, we encourage future EMA studies to report reasons for noncompliance or missing data whenever possible. Regardless of compliance rate, missing EMA data (prompted and unprompted) should be examined for systematic associations with known temporal (eg, time of day, day of the week, chronological day in study, study wave) and demographic (eg, age, gender, race/ethnicity, SES, adiposity) factors [31,32]. A more thorough analysis of missing EMA data would include examining whether the rates and likelihood of unanswered EMA prompts are associated with information provided by temporally adjacent available EMA data (eg, average daily levels, levels reported at EMA prompts before or after the unanswered prompt). Pattern-mixture random-effects regression modeling offers a promising strategy for understanding missingness patterns with EMA data . For data determined to be missing at random (MAR) or missing completely at random (MCAR) (ie, associated with unobserved or observed variables), imputation methods should be considered . With consistent reporting of response and compliance rates, audiences would be able to determine whether the data may be generalizable to all days of the week, times of day, or situations throughout the day. Even though EMAs offer many methodological benefits, there are still some challenges when utilizing real-time data capture methods. Although most EMA studies aim to observe participants’ behavior without influencing it, repetitive exposure to EMA items relating to nutrition and physical activity may trigger participants to adjust behaviors in ways they otherwise would not. Evidence suggests that the mere act of measuring a behavior could have some impact on that behavior in the future . Further, if EMA prompting rates are too frequent and/or EMA questions are too repetitive, participants may opt not to respond to the surveys or drop out of the study altogether. The study with the highest frequency of prompting (44 prompts during weekdays and 68 prompts during weekend days) also reported the lowest compliance rate at 57% . To reduce concerns about participant reactivity and burden, researchers should aim to use the fewest number of prompted surveys possible to answer their questions or interests. Researchers could also consider combining EMAs with other objective measurement to capture the behaviors of interests. For example, Dunton and colleagues used electronic EMA in combination with accelerometry to measure children’s physical activity . In this case, the accelerometry device can continuously measure activity intensity while EMAs can be used to capture other information such as type of activity, and contextual information of activities (eg, where and with whom). Overall, the lack of consistency in reporting EMA methods greatly limits the scientific impact and possible use of findings for behavioral assessments or development of intervention strategies for nutrition and physical activity behaviors in youth. A clear and detailed report of EMA design features could be very helpful for researchers that are new to EMA methodologies. Consistently reporting these types of data will also be useful for future researchers to understand which device/model/systems are effective for nutrition and physical activity assessment studies. Without providing important aspects of EMA design and results, data can be misinterpreted. Researchers may also want to report intrapersonal (person-level) compliance rates, as there might be significant individual variation. In general, reporting more complete aspects of EMA data will help the audience to fully interpret the results, including generalizability and application to future EMA designs. Although this review is unique in that it is the first to examine EMA studies of nutrition and physical activity behaviors among youth, it has several limitations. First, we attempted to be exhaustive in the literature search, but it is possible that some studies may have been missed. Second, since reporting strategies were so diverse, our ability to report quantitative information was limited. Further, for total EMA prompts received and answered, latency, compliance, and attrition rates, so much data was missing across studies that it was hard to make intuitive interpretations of these results. This review presented the data of key EMA methods from 13 nutrition and physical activity studies. Utilizing EMA methods to study nutrition and physical activity in young people has many powerful benefits, including ecological validity and minimizing retrospective response bias. However, based on our review, many studies fail to employ all the features of EMA methods, as described by Shiffman and colleagues , and reporting strategies are inconsistent and insufficient. In order to maximize the impact that EMA data has in the scientific literature, reporting needs to be systematic across studies, allowing greater interpretability and reach of EMA methodologies. Therefore, in order to adequately interpret findings from EMA studies, several items need to be included when reporting EMA methods and results; we created a checklist for others to use. Reporting these key methodological EMA data can enhance efficacy, reliability, and validity of study findings and may lead to increased understanding and interpretation of results. This work was supported by the Early Investigator Award (DP5OD017910; PI: M. Bruening) from the Office of The Director, National Institutes of Health, the National Heart Lung and Blood Institute (R01HL119255; PI, G. Dunton) of the National Institutes of Health, and the American Cancer Society (118283-MRSGT-10-012-01-CPPB; PI, G. Dunton). The content is solely the responsibility of the authors and does not necessarily represent the official views of the National Institutes of Health or the American Cancer Society. Schwarz N. Retrospective and concurrent self-reports: the rationale for real-time data capture. In: The science of real-time data capture: self-reports in health research. Oxford: Oxford University Press; 2007:11-26. Dunton GF. Using real-time data capture methods to investigate children's physical activity and eating behaviors. In: Segel CM , editor. Childhood obesity: risk factors, health effects and prevention. New York: Nova Science Publishers; 2011:105-114. Little R, Rubin D. When questions change behavior: the role of ease of representation. In: Statistical analysis with missing data. Hoboken, NJ: Wiley; 2002. Schafer J. Analysis of incomplete multivariate data. London: Chapman & Hall; 1997. Hedeker D, Rose JS. The natural history of smoking: a pattern-mixture random-effects regression model. In: Multivariate applications in substance use research: new methods for new questions. Hillsdale, NJ: Lawrence Erlbaum; 2000:79-112. ©Yue Liao, Kara Skelton, Genevieve Dunton, Meg Bruening. Originally published in the Journal of Medical Internet Research (http://www.jmir.org), 21.06.2016.